With the Floriade festivities beginning this month we are offering 6 guided walks with a focus on sculpture, landscapes and gardens. 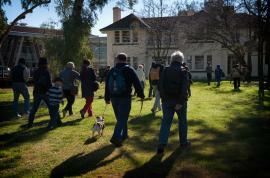 Join Professor Ken Taylor for a scenic walk from Floriade to Acton to hear the early stories of Canberra's landscape design, or go behind the scenes with David Norris, Head Gardener at the National Film and Sound Archive to hear about their winter efforts and spring plans. Professor David Williams will share his insights into ANU sculpture and architecture, or for a longer outing, join the National Parks Association for a Sunday sculpture stroll and picnic. Our popular photography walks, led by Bradley Cummings, will include an exploration of NewActon sculpture and architecture, and the natural and sculpted spaces of Lake Burley Griffin and the ANU International Sculpture Park. In addition, we welcome you to join us every Wednesday for our regular weekly Heart Foundation lunchtime walks. These are a great way to get some regular exercise and meet new people!